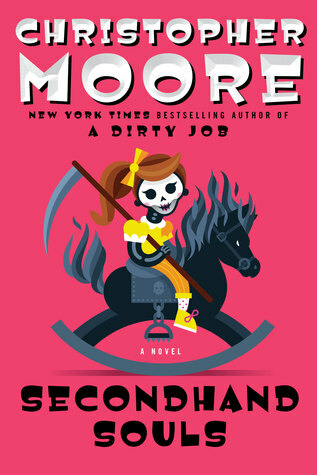 In San Francisco, the souls of the dead are mysteriously disappearing—and you know that can't be good—in New York Times bestselling author Christopher Moore's delightfully funny sequel to A Dirty Job. Something really strange is happening in the City by the Bay. People are dying, but their souls are not being collected. Someone—or something—is stealing them and no one knows where they are going, or why, but it has something to do with that big orange bridge. Death Merchant Charlie Asher is just as flummoxed as everyone else. He's trapped in the body of a fourteen-inch-tall "meat" waiting for his Buddhist nun girlfriend, Audrey, to find him a suitable new body to play host. A Dirty Job was the first book of Christopher Moore’s I picked up and since then I’ve been hooked. A Dirty Job is my favorite book he has written so when I saw this coming out I waited anxiously to grab it up and read it. I ate this book up. It brought back all the wonderful character from A Dirty Job and of course my favorite Death Merchant Charlie Asher ( still not in his human form). I laughed all through this book. Stopped at places and repeated paragraphs and lines to my husband that I found too funny not to share and when I was finished I found myself quoting it at random times during random situations. .I love all this authors books. If you want to read a hilarious, action filled, WTFish, sometimes crude book pick this one up…. After reading A Dirty Job of course.